Child Abuse Pediatricians: Are parents being wrongly accused? They are called Child Abuse Pediatricians, and they say their mission is to protect children. However, local parents, attorneys and even some doctors say some of these specialists are tearing families apart. The Parker family says they were emotionally and financially devastated after a false accusation of child abuse. Their lawyer says she’s had to fight against the same Child Abuse Pediatrician who accused the Parkers about 20 times, and they want to warn other families. They are called Child Abuse Pediatricians, and they say their mission is to protect children. However, local parents, attorneys and even some doctors say some of these specialists are tearing families apart. The Parker family says they were emotionally and financially devastated after a false accusation of child abuse. Their lawyer says she’s had to fight against the same Child Abuse Pediatrician who accused the Parkers about 20 times, and they want to warn other families. Allie and Jimmy Parker are grateful for every second with their children, Isabella and Dylan. Last April, Child Protective Services workers took both babies from the Westland couple because one pediatrician accused them of abusing 6-week-old Dylan. “I said why can’t we get a second opinion, why is this one physician’s opinion the end all be all to your decision to terminate our parental rights," Allie said, adding that it was just how things go because the doctor was the expert. The Parkers are talking about Child Abuse Pediatrician Bethany Mohr from the University of Michigan’s C. S. Mott Children’s Hospital. They’re not the only family who says Dr. Mohr’s accusation of child abuse tore their family apart. “It’s been the hardest thing I’ve ever been through in my life,” said Josh Burns in 2015, after he was accused of abusing his daughter. 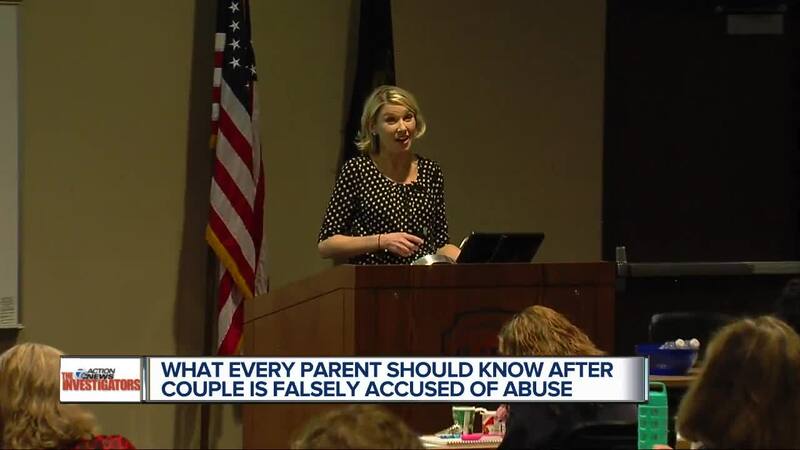 Back in 2015, the 7 Investigators showed you how several parents had to battle allegations of abuse and neglect, even though they say their children had medical causes for their illnesses and injuries. Ultimately, none of their parental rights were terminated. The Parkers say their experts showed the court that Dylan’s rib fractures were caused by brittle bones from a severe vitamin D deficiency, not abuse. The case was dismissed. “By the middle to the end of the trial, we were indigent, we were already petitioning the court for funds for our last witness,” said Jimmy Parker, Dylan's father. Dr. Mohr would not agree to an interview, but our cameras were rolling during a presentation she gave to first responders back in 2015 about when to file abuse reports with Child Protective Services. “How many kids would potentially be in harm’s way if we only filed on things that were really clear cut," Dr. Mohr asked during the presentation. Her response: "Tons of kids." Dr. Smith volunteers his expertise for families facing abuse allegations from Child Abuse Pediatricians, including eight who have been accused by Dr. Mohr. When a Child Abuse Pediatrician interviews you, legal experts say you won’t be advised of your rights like you would if you were in police custody. However, you should know that anything you tell someone like Dr. Mohr can be used against you. A law professor at the University of Wisconsin says Dr. Mohr's way is a recipe for disaster. “It’s just a recipe for error and for injustice,” said University of Wisconsin Law School Professor Keith Findley. Findley says Child Abuse Pediatricians have a huge amount of influence with the jury, and when they make a medical diagnosis of abuse, your presumption of innocence is gone. “So to say that doctors can diagnose the conduct and intent of some third party actor is really beyond, beyond what medicine can support,” Findley said. Mary Masson, director of public relations for Michigan Medicine, declined our request to interview Dr. Mohr, but did tell us that when Mohr meets parents she says she is part of the Michigan Medicine Child Protection Team. Masson said Dr. Mohr explains that she does not work for Child Protective Services but that she does communicate closely with them. “To protect patient privacy, we can’t discuss a specific patient’s care. It is important to note that under Michigan law, all medical providers are mandated to report any suspicion of child abuse or neglect. Failure to do so can result in criminal and civil liability, as well of loss of licensure for the medical provider. We want to stress that Michigan Medicine’s child protection team has extensive expertise and uses evidence-based medicine in analyzing medical findings to evaluate whether injuries are suspicious for child abuse. This team does an exhaustive review of information at C.S. Mott Children’s Hospital when there is suspected abuse of an infant or child. This is an extremely valuable team that protects the safety of children. The team is responsible for providing the most accurate medical diagnosis to the appropriate agencies and cooperating with investigations, but U-M providers do not make decisions or recommendations about whether or how cases are pursued; including criminal prosecution, termination of parental rights, or removal of children from their homes. Our medical providers are often subpoenaed to appear in court regarding children they have personally evaluated and are required by the courts to testify. abuse/neglect. The contract with Michigan Medicine ended in December of 2015 and we have not contracted with the State of Michigan for consults since that time. The Parker Family has set up a Go Fund Me page to help offset their legal bills. If you have a story for Heather, please email her at hcatallo@wxyz.com or call 248-827-4473.